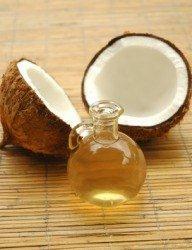 For Health, Wellness, and Fitness.....It's a mindset....: The Amazing Properties of Coconut Oil. The Amazing Properties of Coconut Oil. Dr. Mercola posted on a website www.nowheatnodairynoproblem.com (which I will comment on more later...it's amazing...but I digress) a wonderful article about the many benefits of coconut oil and the reason why it is a better choice among other oils. Even though it is a saturated fat it is a natural one. One that our body desperately needs. You see, we as a society have been trained to believe that "saturated" fats are bad for us and, yes, the manufactured ones are. These oils are hydrogenated which means that they have been heated to a certain temperature and made to be a thick, rancid oil that is only conducive to shelf food that is often processed and packaged. These manufactured fats are also called "trans" fats. No doubt you have heard a lot about these and why they are detrimental to your health. The conclusion made by the medical community that is wholly agreed upon is that many vegetable and seed oils that are saturated by artificial means are bad for you. Unfortunately, there have been some other trans fats that have been exclaimed to be "healthy" and "heart friendly" by the same companies that produce the unhealthy saturated fats. See where I'm going here? It is all about the money for these people. So saturated fats have become banned in most states and because of the research involving it most people are scared away from it, and rightly so. However, the air needs to be cleared on the fact that not all saturated fats are equal. The one we want to discuss today is the oil from coconuts. The reason this saturated fat is good for you is because it was created naturally. Over many years research has been done on the cultures of tropical communities that have coconut rich diets. You know what they found? That those whose diets consisted of coconuts were found to have a lesser chance of cardiovascular diseases. 5. Provides you with an immediate energy source. 7. Supports the proper functioning of your thyroid gland. Dr. Mercola goes on to discuss each of these benefits in more detail so I won't bore you with my rendition. Please read his article and find out how coconut oil can really make a difference in your life.